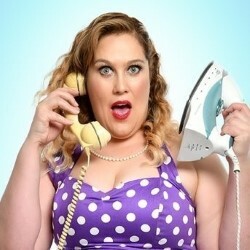 Three years ago comedian Lucy Frederick – 'Delightful' (BroadwayBaby.com) – was picking herself up from the floor and ordering a gin and tonic; now she is picking up dirty socks and ordering fish fingers and peas. From disaster queen to model stepmum – this is a stand-up show about Lucy's journey towards becoming part of a modern blended family, avoiding its wicked pitfalls and navigating the alarming world of parenting. 'A genuinely gifted performer' **** (Scotsman). 'Strong and diverse' **** (ThreeWeeks). 'Like catching up with a best friend' **** (TheWeeReview.com).